The common tern is a Nearctic and Palearctic colonially breeding and migratory seabird. 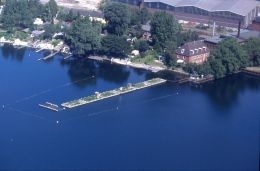 The data we collect come from a long-term study population located in the Banter See at Wilhelmshaven on the German North Sea coast. 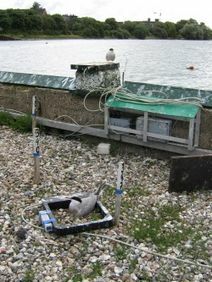 The colony was initiated in 1984, when ringing of chicks commenced too. In 1992, 101 adult birds were caught and marked with transponders, and since 1992 all locally hatched birds have similarly been marked with a transponder shortly prior to fledging. The colony site consists of 6 concrete islands, each of which measures 10 by 5 meter and is surrounded by a 60 cm wall. 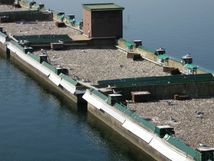 The walls support 44 platforms for terns to land on, and each platform is equipped with an antenna which reads transponder codes to record the presence of all transponder-marked individuals. Half of the platforms is additionally equipped with a scale, so that we obtain annual weight data for most individuals too. As said, data regarding the presence of transponder-marked birds is collected non-invasively using antennae with which 44 platforms on the walls surrounding the colony are equipped. During incubation, which is shared between partners, additional antennae are placed at each nest for 1–2 days to identify breeding individuals. Combined with 3-times-weekly checks of nests to record reproductive parameters and to mark offspring, these methods enable the systematic and remote documentation of individual presence and reproductive performance at the colony. Once birds have established themselves as Banter See breeders, their re-sighting probability is almost 100% and their return rate, not conditional of survival, is 90%, such that we can collect data over long individual life cycles. Since 1992, the number of breeding pairs has ranged between 90 and 715. * Average age of breeders: 8 years. * Oldest bird recorded: „Kirsi“, 27 years (in 2017). * Longest pairbond: „Lotti“ and „Otto“: 16 years. * Adult annual survival probability: 90%. * Average annual reproductive success: 1 fledgling/pair.